Wrecking any car is a tough experience but severely damaging a Koenigsegg CCXR Special One worth an estimated $1.5 million must really hurt an owner's heart. Unfortunately, an owner in Mexico City is feeling this terrible pain, and there are photos that capture the considerable damage for the whole world to see. Judging by the photos, the damage is largely on the passenger side, but looking closely indicates there's some destruction to the driver side of the rear bumper, too. The front end incurs most of the harm, especially the fender area directly below the A-pillar where the body panel is gone. The suspension is also broken, as evident by the way the wheel is oriented. The owner intends to rebuild the car, according to Infobae, but the process reportedly could take quite a bit of time. 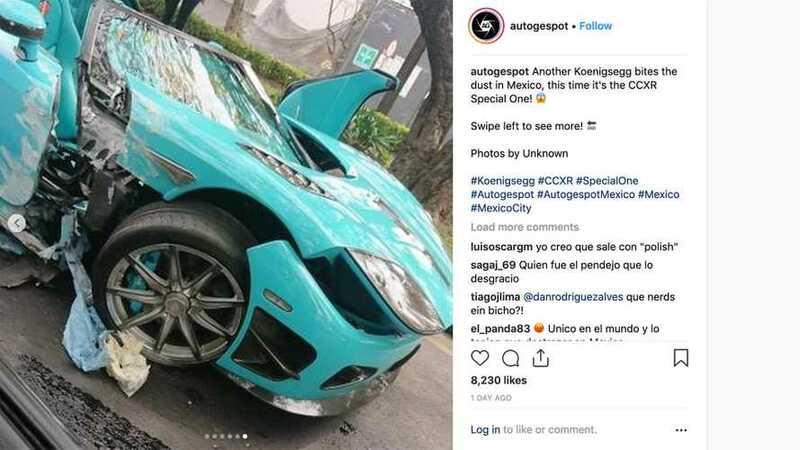 Koenigsegg reportedly doesn't have the spare parts on hand to immediately repair this car, so the owner has to wait for the automaker to remake them. that mostly focused on this CCXR. The first post from August 7, 2018, showed the vehicle's emblem with the message "coming home soon." A later image caught the machine's arrival in Mexico in October 2018. Koenigsegg originally built the car for Ana Al-Thani, a member of Qatar's royal family, who ordered it in the vibrant shade of blue with a matching interior. The CCXR was Koenigsegg's revised take on the CCX that modified the 4.7-liter twin-supercharged V8 to run on E85 and E100 ethanol. The powerplant produced a lofty 1,004 horsepower (749 kilowatts).